Surprise classic RPG remastering attack! 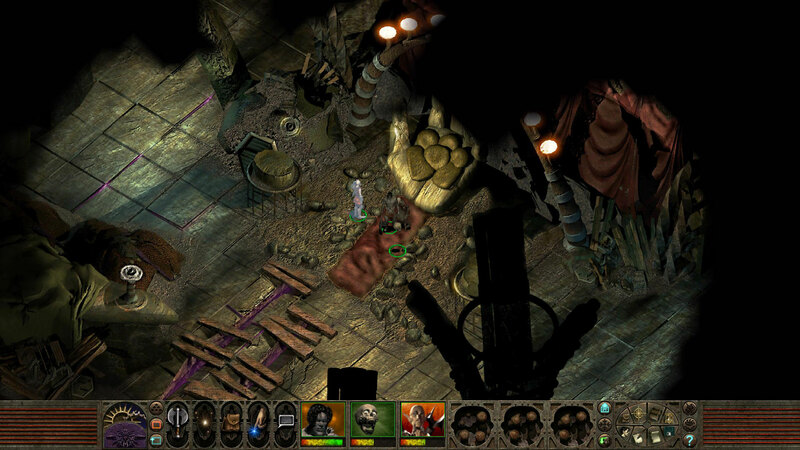 Mere weeks after revered 1999 philoso-roleplayer Planescape: Torment [official site] enjoyed a belated spiritual sequel in the over-lored but otherwise strong Torment Tides Of Numenera, it gets itself a modernised re-release too. It’s due out April 11, but I’ve got the thing updating my hard drive’s journal and changing the nature of my VDU right now. We’re not going to run a full review because we all played PST a thousand years ago and know full well it’s a solid-gold classic of narrative’n’choice-led games, but I do want to look at what’s changed in Beamdog’s ‘Enhanced Edition‘ and whether it’s a meaningful improvement. It’s a bit of a mixed bag, though the net result is the most playable and best-looking version of PST to date.In terms of what it’s trying to do to the old man Torment, the Enhanced Edition has three primary goals. One! Compatibility and bug-splatting. 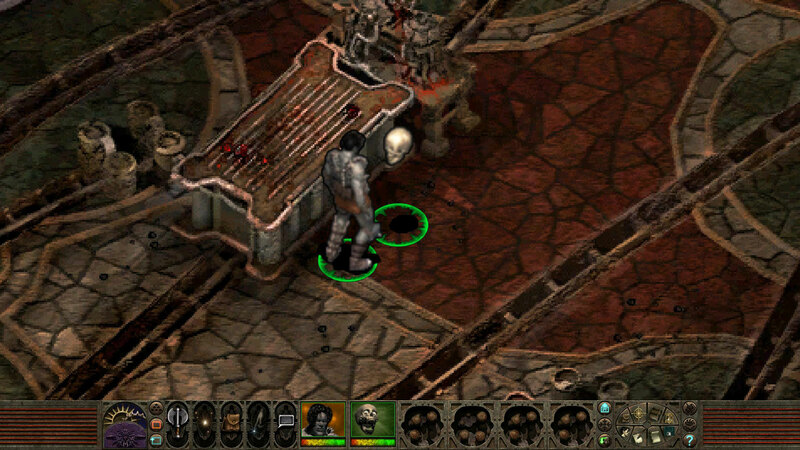 GOG’s already sorted out some of the former, but PST always had a few nasties built in. Having not played the remaster from start to finish I can’t entirely attest to all being smooth sailing, but I’ve certainly not hit any howlers while jumping between savegames set in various key areas. Click to enlarge. Zoomed in, sprite outlines turned off, filtering still on. Looks a bit messy, though you can’t tell that from just this thumbnail. Point the second is quality of life improvements, and this means something of a do-over for the user interface. First and foremost of those is resolution scaling for the action bar, fonts and whatnot. We’ve been able to bump PST up to HD and beyond with fan-made utilities for years, but the UI and text ended up tiny and mangled as a result. There were fixes upon fixes, but you needed to be patient and committed and risk it all going horribly wrong part way through. So the main draw of the EE, as far as I’m concerned, is that all of this stuff is part and parcel and just works out of the box. Newly added elements, including a limited zoom, tab-to-highlight interactive objects, an auto-loot button and how-to-play pop-ups, I can take or leave. Nice to have and perhaps shave a few extra years off a near-20-year-old game, but they’re timesavers rather than true reworkings. Click to enlarge. Sprite outlines off. Tab-to-highlight is the biggest win there in my experience so far, while on the other side of the coin, the how-to-play stuff and other added menu/loading screen stuff looks as it if were transplanted from another game entirely. I’m sure it will help people who’ve only heard the legends and so lack the years of putting-up-with-bonkers-UIs training that those of us old enough to play PST back in the day have, though. And the third, most obvious rejigger is, of course, graphics. Specifically, the resolution. Unmodded, original PST is locked to 640×480. Not quite as unbearable in practice as it sounds, but a greater tragedy than the softness inherent in stretching this across a high-res LCD monitor is that it only allows you to see PST’s wonderful, elaborate, weirdo 2D environments in small chunks. PSTEE simply adopts your desktop resolution (there are no in-game resolution options), and apparently supports 4K, although I’m afraid I don’t know what happens beyond that. It all works fine on my 3440×1400 screen, at any rate. Click to enlarge. Sprite outlines and filtering turned on, which has mixed results as you can see. The beauty of higher res is that you see huge swathes of the environment all at once, what would have been single screens in the vanilla version now stitched together into whole places, and their hand-made sensibility gives them a visual fidelity that is rare even by today’s standards. PST is most famed for its maudlin, introspective, questioning writing, but it was always the places that locked in my memory. It’s these that most benefit from the EE. The downside of higher res is that, if you go beyond 1080p, the spell starts to break. Not in terms of compatibility or anything like that – simply that 1440p and above seem to be exceeding how much the game can display without having to enlarge its tiles and textures beyond their original dimensions. At 3440×1440, PSTEE’s pixels really show, like I zoomed in too far in Photoshop. Click to enlarge. This is the game running at 1440p (then downscaled to 1080p to be more browser-friendly) – you can see the pixelisation and aliasing I was on about. One cannot expect miracles – this is a remaster, not a remake, and as such it’s using original assets rather than rebuilding them from scratch – but though I accept the necessary reality, I can’t help but feel a little saddened that I did not get the ultrawide sprawl of gorgeousness I’d hoped for. (Never, ever buy high-end hardware, kids, it’s only ever making yourself a victim of your own expectations). Perhaps some sort of filtering could have helped, but that option for backdrops is not there. However, on a 1080p monitor PSTEE is just the ticket. 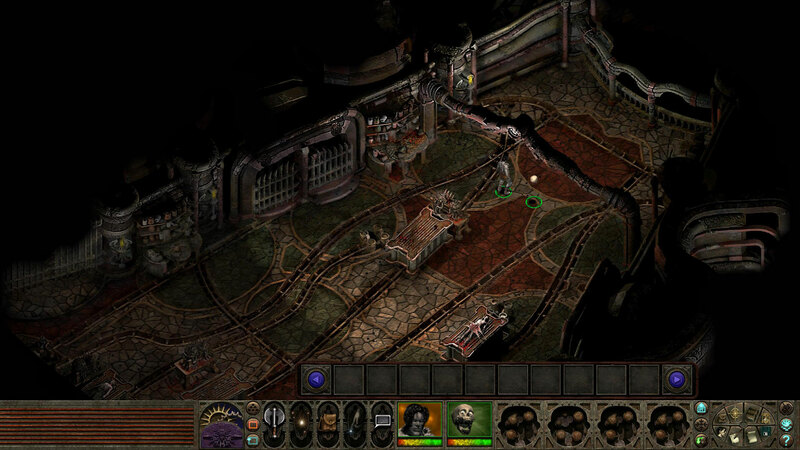 There’s still some grain and aliasing, but by and large it looks like Planescape was always built to be this way. On the other hand, the optional zoom-in feature only makes everything look low-res and nasty. Once in a while, scrolling in a couple of clicks might help your cursor to find a smaller interactable, but by and large it both serves no purpose in addition to the game very obviously not being made for this. Click to enlarge. Here you can see how PSTEE doesn’t look too rosy if you zoom in all the way. Character sprites are more broadly problematic. They were pretty low-detail and pixelly even at the time, and blown up to high res then with a few new post-processing effects applied they only look more like soup pressed into bipedal form. The good news is that turning off said post-processing makes a big improvement. Better to look like crisp pixel-people than the blurred, excessively outlined splodges the EE makes them by default. They might not look modern, but they do look natural. The effects – a smoothing option and a dark outline intended to make sprites stand out more – remind me of the filters you might try once then turn off forever in, say, a retro console emulator. They’re not awful, but it simply looks better – sharper and less artificial – with them off. Their effects are also worsened above 1080p. 1080p, cropped, character outlines on. Me no likey. Other than those and the zoom, I left all the new EE features turned on, but the option to have it running in, essentially, vanilla mode is there if you’re a crazy purist and/or still own a CRT monitor. 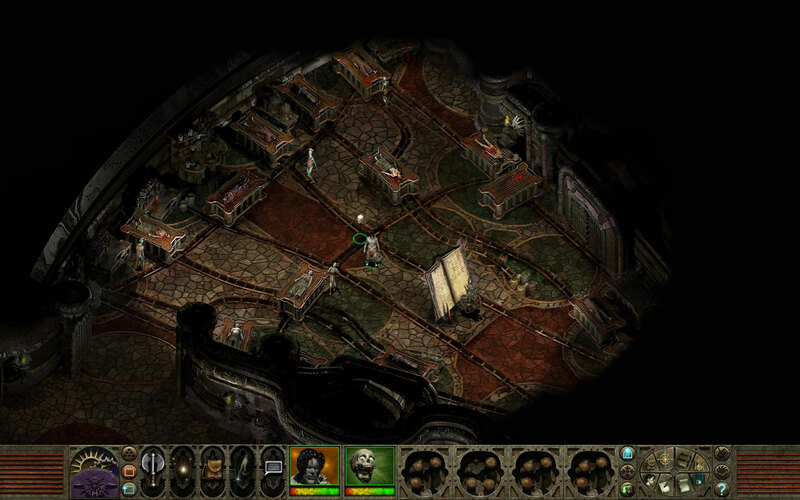 All told, my short-term impressions are that, yes, this is the most easy-to-play and best-looking official version of Planescape: Torment to date, able to smooth off enough rough edges that you won’t truly feel as though you’re wrestling with an 18-year-old videogame. You probably won’t feel as though you’re playing a 2017 videogame either, but the important thing is that we get an RPG masterpiece made more or less modern without sacrificing anything important in the process. I’d love to see a more thorough reworking, of course I would – more specifically, new sprites and more VO, not that the latter is realistic – but I rather suspect that the core game is, in the main, so well-realised that that there’s little extra to be won anyway. Click to enlarge. 1080p, zoomed out all the way, sprite outlines and filtering off – the best way to play, IMHO. Which leads me onto my final point – yes, a few hours with PSTEE reminded me of what a good videogame it largely is (combat’s a weak point, and some of the character designs are a bit too wanky, in both senses of the word). I enjoyed last month’s Torment: Tides of Numenera, but at times it almost chokes on the volume of its own words, losing clarity and punch because it comes across as having been unwilling to edit down its lore and its pomp. This is particularly true of its opening sequence, which is a barrage of fantastical neologisms and exposition, and an excess of second-person commentary. By contrast, PST’s cold open has you waking up in a mortuary, immediately addressed by a wisecracking skull who informs you you were dead a moment ago, and tasked with finding a way up. You’re introduced to some of the weirder aspects of how its world works as you play, a tertiary focus to a clear goal and the overriding mystery of how and why you came back from the dead. Click to enlarge. 3440×1440 (downscaled after the fact), which gives a good sense of the sprawl of the environments. Though PST is famed for its word count, the mandatory opening dialogue is tight and sparing, rather than verbose for the sake of verbosity. I know how the story plays out already, and sure, what seemed like high literature to me 18 years ago has a more obvious pulpish quality to it now, but even so, the sense of mystery and strangeness and character grabbed me all over again. Not played PST before? PSTEE is all the invitation you need. Native high-res support, scaleable UI, a few helping hands and most of all it just works. Played PST before? Well, like me, the last time round you probably did it modded, and as such PSTEE, though a smoother ride, won’t feel particularly revelatory. If it’s your first time back since 1999, however, rest assured that it treats your memories well. 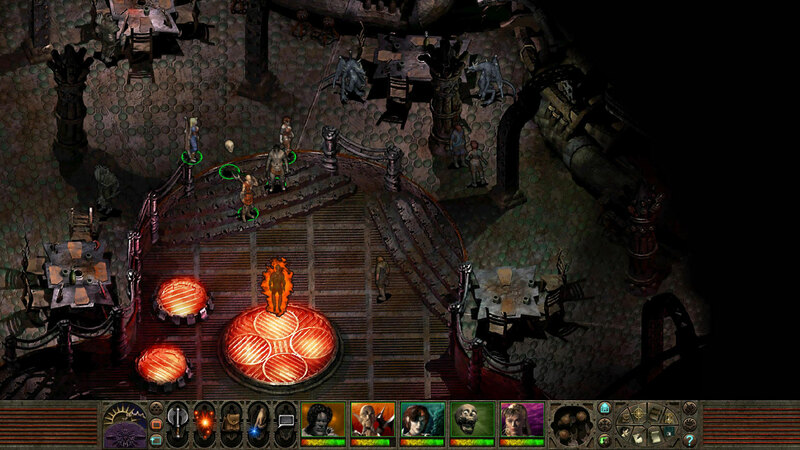 Planescape: Torment Enhanced Edition is due for release on April 11, for Windows, Mac and Linux via Steam, GOG and Beamdog. It’s getting mobile versions too. 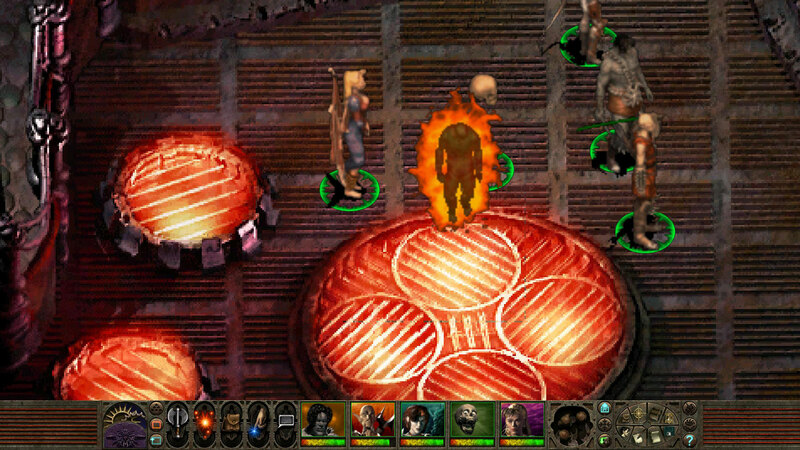 Tagged with Beamdog, Black-Isle, feature, Planescape: Torment, Planescape: Torment: Enhanced Edition, Torment: Tides of Numenera.